The other day I got a comment on one of my pictures that said “I see that you prefer chickpeas!” Guilty. Chickpeas have become my favorite bean over the past couple of months which is ironic because in the past I’ve absolutely hated them! I’ve always loved hummus and I’ve loved roasted chickpeas but for some reason I could just never eat chickpeas by themselves. 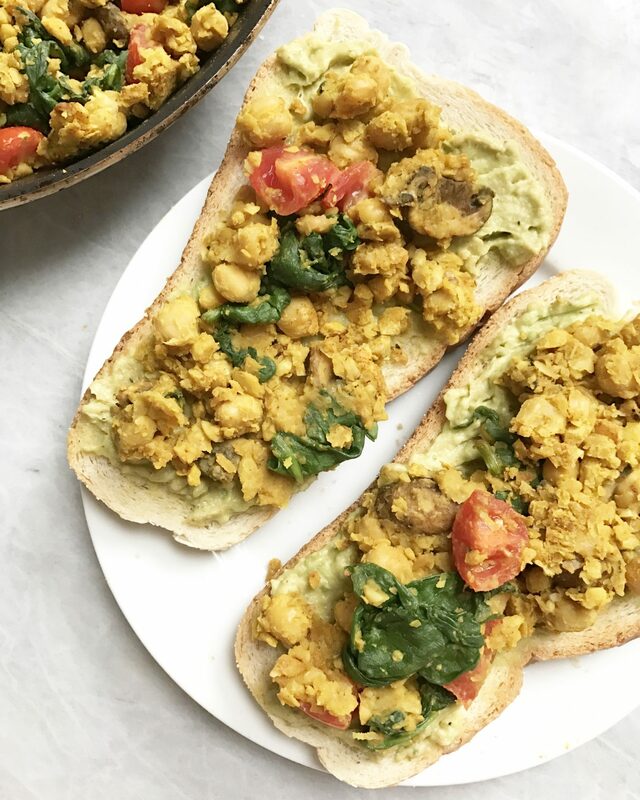 The other week when I ran out of tofu and I was craving a savory breakfast I thought, “Why not try chickpea scramble?” It was a recipe I haven’t really seen around, but it seemed like something that could be semi normal. It ended up being more than normal…I am fully addicted now! I also know that some of the people who view my blog are allergic to soy, so this is a great alternative for them. The same goes for those who may just like dislike tofu. This recipe is so easy to make and you could totally switch up the veggies in it and make it your own. I just wanted to stick to the basics and show veggies that I always have on hand. Though I am a person who dislikes leftovers, I actually had this a day (and two days!) after and it still tasted amazing. 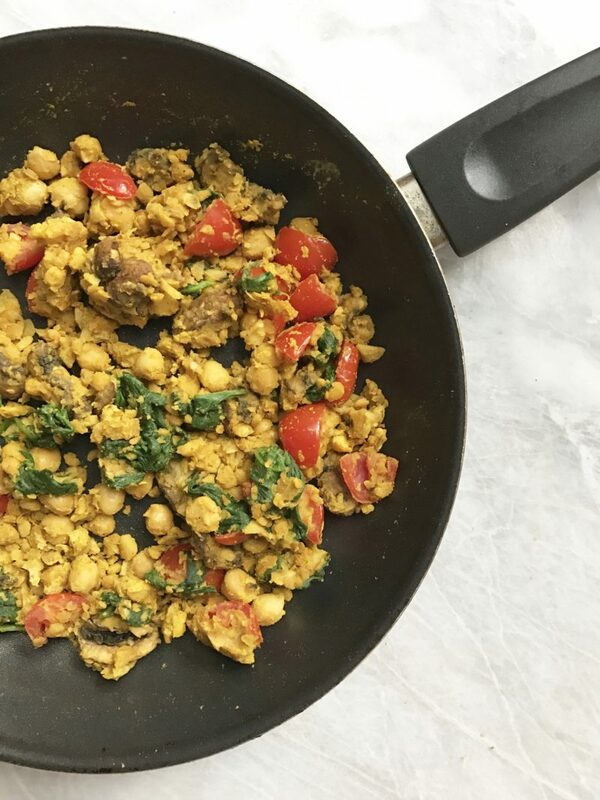 Knowing this, I definitely will keep making this in advance and have it in the morning for an easy and protein packed breakfast. This semester I have a few morning classes and I don’t have time to make a full on breakfast. Now I know I can make this and keep it in the fridge for up to 3 days and have a fast breakfast to throw on toast and be full for hours. I hope you enjoy this recipe! Remember if you make it, “tag” me on Instagram so I can see! 1 15 oz. Can Chickpeas, Drained. Drain & wash your chickpeas and put 3/4 of the can in a bowl. Mash them well with a fork until it's a smoother consistency. Add the remaining 1/4 into the bowl and set aside. Chop your mushrooms into slices and half your tomatoes and set aside. Heat a nonstick pan on medium heat and add 1 tsp Vegan Butter (or non stick oil spray) and 1 tablespoon of water and wait until heated. Add in your chickpeas and stir for 2 minutes. After 2 minutes, add in all of your spices. Continue stirring for another 2 minutes. Add in your mushrooms and cook until they start to wilt, another 3 minutes. Add in your spinach and mix around until wilted, around 2 minutes. At the last minute, add in your tomatoes. I like to do this on the final minute because they still maintain their shape but still get cooked down. Serve with either toast or hash browns! Hi. This looks great. Please clarify if you mash 1/4 or 3/4 of the chickpeas. Thanks! Yes! I enjoy making omelettes with chickpea flour. It’s a fun option!